The Plantronics Blackwire 700 Series Leather Ear Cushions is a set of ear cushions black leather for use with Plantronics Blackwire 710 and the Blackwire 720 wireless headsets series. The set of Leatherette Ear Cushions for Blackwire 700 series is ideal for offices and call centers that use headsets intensively. It is compatible with Plantronics Blackwire 500 series. 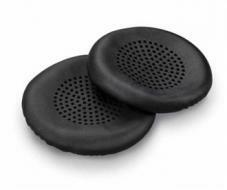 While traveling, these ear cushions are very useful as they are comfortable and save your ears from any kind of pain. Due to the usage of this Leather Ear Cushions ears cannot be disturbed during loud voice. These cushions also save the headset from dust particles.